Cross Stitch mobile game is a free-to-play mobile game built for Android and iOS devices. It’s a brain and puzzle game developed and published by Inertia Game Studios. Its original release was on March 10th, 2016. 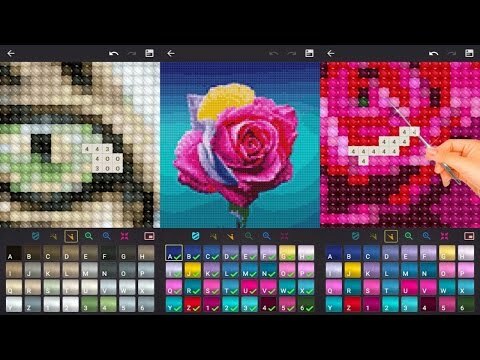 Cross Stitch mobile game enables the player to experience enjoyable cross-stitching on their tablets or mobile devices. You don’t have to thread needles or risk pricking your fingers as the game allows you to stitch by touching and tapping the screen of your device. The game is quite simple as there are more than a thousand beautiful patterns that you can work on. You only select the right color of thread for you and click them in order to place stitches. The first thing you’ll do when playing Cross Stitch mobile game is to select make a selection of the pattern that you’d like to stitch from the collection. After opening the pattern, you can go ahead and click 3x or 2x after which you can go ahead and click any part of the pattern to zoom. After zooming you can start stitching right away by choosing your first thread color. The colors are found on the right-hand side of your screen. In order to place a stitch, you can make use of the numbers and letters. This will help you use the correct colors to fill in the pattern. The game highlights the empty stitches of the colors of thread that you’ve chosen. However, this option can be turned off on the Game Options from the Main Menu. A yellow triangle appears over your stitch if you make an incorrect one. In this case, the player can click on the “Undo” button to get rid of the last stitches that have been done wrong. Alternatively, you can make use of the “Unpicker” tool to only get rid of the wrongly done stitch. This is done by clicking the tool and then clicking the incorrect stitch and finally clicking the tool once more. In case of any mistakes, you’ll notice a mistakes button on the top left. By clicking this button, you are taken straight to a specific mistake in your pattern. If you need to pause, you can just leave it after saving it by clicking the Save button before signing out from your account. This allows you to come back at any time and continue with your stitching. Cross Stitch allows you to play with your Facebook friends only. If you’re not already friends, you need to send them friend requests first. The game has Cross Stitch Cash which you can use to make purchases in the game. The game has different patterns that a player can pick from. You have to pick a pattern at the beginning of the game and use your stitching skills to complete it. In order to buy new pattern sets in the game, you can use Cross Stitch Cash. The cash also helps you prevent mistakes, creating your own patterns and obtaining patterns from friends. The player can play with other friends who must be on Facebook as their friends. If you want to play with your friends, therefore, you must be friends on Facebook first. These friends can gift you with extra patterns. The Game Club gives you free rewards in the game world where you can try out other games built by the same developer. For those who love stitching, this game is an absolute experience that you should try out. As a matter of fact, anybody can try it out and you’ll not regret the experience.